The United Nations Security Council approved new sanctions aimed at punishing North Korea for its latest missile and nuclear tests after the U.S. dropped key demands in order to win support from Russia and China. The 15-member Security Council passed the resolution unanimously Monday following a week of talks that began when Kim Jong Un’s regime tested its most powerful nuclear bomb. The resolution seeks to cut imports of refined petroleum products to 2 million barrels a year, ban textile exports and give countries the ability to freeze assets of cargo ships whose operators don’t agree to inspections on the high seas. “We are acting in response to a dangerous new development,” U.S. envoy Nikki Haley told the Security Council after the vote. “These are the strongest measures ever imposed on North Korea,” she said, adding that the U.S. remains willing to act alone to stop Kim’s nuclear program if necessary. While the U.S. can claim a victory in persuading Russia and China — which hold veto power on the Security Council — to agree to the restrictions, the result is less than Haley had sought when she pushed for a ban on oil and a freeze on Kim’s assets abroad. And it’s unlikely to persuade Kim to halt his nuclear program and return to the negotiating table. “Despite the tough talk, the U.S. is willing to water down its demands to get support of Russia and China, and that is a calculation that we are more influential when there is Security Council unity,” said George Lopez, a professor of peace studies at the University of Notre Dame and a former UN expert on sanctions against North Korea. Representatives of China and Russia attempted to prod the U.S. toward a diplomatic solution, emphasizing that the resolution calls for negotiations. “The DPRK shall make absolutely sure that the U.S. pays a due price,” the Korean Central News Agency said, citing a statement by the Ministry of Foreign Affairs and using initials for North Korea’s formal name. Despite the rhetoric, there were signs both sides are looking for a diplomatic solution. North Korean foreign ministry officials were said to be planning informal talks with former U.S. officials in Switzerland on Monday, Japan’s Nippon Television reported, without saying where it got the information. Some Chinese banks have started banning new North Korean accounts or blocking new deposits to existing accounts, the Financial Times reported. U.S. officials said the new measures would cut North Korean exports by 90 percent, pinching the regime’s ability to get hard currency. The textile export ban alone would cost North Korea about $726 million a year, the U.S. said. Yet Kim has repeatedly shrugged off previous sanctions, staying focused on the goal of developing an intercontinental ballistic missile capable of delivering a nuclear warhead to the U.S. mainland. The Security Council has called for the resumption of six-party talks aimed at negotiating a complete denuclearization of the Korean peninsula. Those talks — which included North Korea, South Korea, China, Russia, Japan and the U.S. — broke off in 2009. The Security Council vote comes just over a month after UN diplomats targeted about $1 billion in North Korean exports following an earlier missile test. 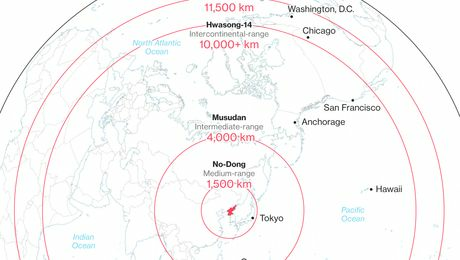 Short of a military conflict that analysts said could lead to millions of deaths and the destruction of Seoul, economic sanctions are among the few options available. President Donald Trump has repeatedly urged China to use its influence to rein in Kim’s regime and he’s said Japan and South Korea can buy more sophisticated U.S. military equipment to defend themselves from attack. China supplies most of North Korea’s estimated 10,000 barrels a day of crude oil, according to the U.S. Energy Information Administration. On Aug. 30, Trump said “talking is not the answer” when it comes to dealing with Pyongyang. China, though, has been reluctant to shut off its oil pipeline to North Korea or undertake any measures which could lead to a failed state on its border. Before the vote, South Korea’s envoy to the U.S. said more could still be done. “This in fact is the time when we should be doubling down and tripling down on pressure,” Ambassador Ahn Ho-Young said Monday in Washington. The UN resolution also asks countries to inspect ships entering and leaving North Korean ports. However, the earlier U.S. proposal would have empowered nations to use “all necessary measures” to interdict ships suspected of carrying weapons material or fuel into North Korea.